William Blake. Äktenskapet mellan Himmel och Helvete, trans. Folke Isaksson with an afterword by Göran Malmquist. Tystberga, Sweden: Bokförlaget Epokhe. n.d. 71 pp. + frontispiece and 27 color plates. Although this is not the first rendition of The Marriage of Heaven and Hell to appear in Swedish,1↤ 1 Folke Isaksson mentions that he produced a translation which he now regards as inadequate, for a volume entitled Dikter och profetior [Poems and Prophecies], published by FIBs Lyrikklubb in 1957. FIB stands for Folket i Bild [The People in Pictures]. 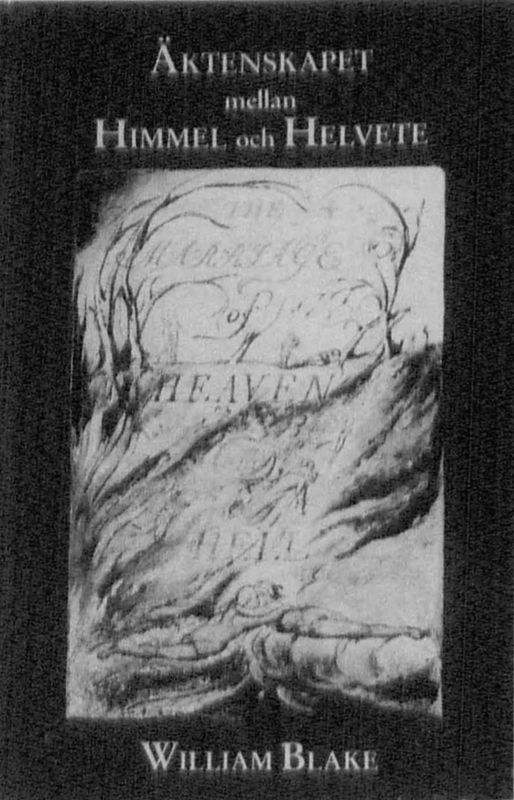 The existence of this volume, presumably produced for the bicentennial of Blake’s birth, does not seem to have been noted in any Blake bibliography. it is by far the most ambitious. It comprises four elements: a translation of the text by the well-known poet Folke Isaksson, a short foreword by the translator, color reproductions of all the plates, and an afterword by the sinologist, Blake scholar, and member of the Swedish Academy, Göran Malmquist. These parts are of such disparate quality that it is impossible to render a single judgment of the volume. Perhaps the best way to begin is by asking what such a book ought to accomplish. An edition of Blake in a foreign language should presumably provide a clear, accurate text, a critical introduction and select bibliography, and in the case of an illuminated book, trustworthy reproductions of Blake’s etched pages. Äktenskapet succeeds admirably in the first category, fails in the second (although some compensation is provided in the afterword), and achieves only mediocre results in the third. A review of this book is therefore bound to be somewhat fragmentary, taking up each of these parts separately. Folke Isaksson’s translation is on the whole excellent. Isaksson manages to render the tone and rhythm of Blake’s English in a Swedish version that is poetic but free of unnecessary archaism. Isaksson retains Blake’s use of uppercase lettering but alters his punctuation; the latter is sometimes but not always necessary. (Cf. for instance pl. 14, where Isaksson substitutes a period for a comma after Hell and a semicolon for a comma after tree of life.) Isaksson shows a sure sense of style in his freer renderings; thus for instance poetic tales (pl. 11) is translated as sägen och dikt rather than the literal poetiska berättelser. Mistakes are few and unimportant. It would probably have been better to render This said he, like all firm perswasions, is come to pass (pl. 13) as Denna . . . har liksom varje annan fast övertygelse blivit fullbordad or har blivit uppfylld, rather than har blivit godtagen, as Isaksson does. In plate 10, one might question the translation of unacted desires as otillfredsställda (“unsatisfied”) begär; perhaps oprövade lustar would have served. But these are mostly suggestions; Isaksson has splendidly performed his difficult task and has managed to provide Swedish readers (who, if they are interested in Blake, may know some English but probably not enough to fully understand the original) with an excellent text to accompany the plates. This is consonant with the know-nothing view of Alfred Kazin, whose essay of 1941 (or perhaps a later reprint of it) is the most recent critical work to be referred to here (5). Shouldn’t an introduction to The Marriage invite the curious reader to further exploration rather than uninformed dismissal? As there is neither annotation nor bibliography, however, such a reader is going to be hard put to understand even the work at hand. Why is a new heaven begun, and why is it thirty-three years since its advent? Who is Rintrah, merely referred to as “wrathful, fireshaking” in the foreword (6)? Shouldn’t an edition such as this provide answers to begin page 210 | ↑ back to top such questions or at least tell the reader where to look for answers? The illustrated portion of Äktenskapet begins unpromisingly with its choice of frontispiece. This is the image of Blake that goes back to Thomas Phillips’ portrait of 1807, but the picture reproduced is neither the original nor Schiavonetti’s engraving after it; it is W. C. Edwards’ engraving of 18302↤ 2 This first appeared with Allan Cunningham’s Lives of the Most Eminent British Painters, Sculptors and Architects, vol. 2 (London: John Murray, 1830). We thank D. W. Dörrbecker for this information. that bears little resemblance to any lifetime portrait of Blake. Of course the main illustrative matter comprises the 27-page color reproduction of The Marriage. Here the choice of an original is impeccable: it is the magnificent Fitzwilliam Museum copy H.[e] Another reproduction of this copy, the Oxford University Press-Trianon Press edition of 1975, is still in print, and in reviewing the latter John Beer, while calling it “a beautiful book,” noted a number of deficiencies.3↤ 3 Blake 11 (1977): 42-44. Some of these, such as the nonreproduction of the gilt that Blake used on many pages, are general; others relate to specific plates. If we were to apply such standards to Äktenskapet, we would have to compile a long list of color deviations, but such a detailed comparison would be futile, as it must simply be said that the color values of this reproduction are generally untrue to those of the original. The coloring is comparatively pallid, and the white areas of Blake’s pages are generally translated into blues and grays so that at times it is impossible to tell where such effects are due to color washes and where to reproductive distortion. This may have something to do with the limitations of four-color printing (the Oxford-Trianon edition used seven and sometimes eight colors), but the problem is compounded by the use of glossy paper of a kind unknown to Blake, so that the total effect is unlike anything Blake produced. It is a pity that the publishers did not insist upon greater fidelity of reproduction. by Göran Malmquist, editor and translator of An Island in the Moon.4↤ 4 En Ö på Månen (Uppsala: Brombergs bokförlag, 1979). Reviewed by Erik Frykman in Blake 14 (1981): 217-18. However, Malmquist has chosen to do something intriguingly different in his “Wilhelm Grønbech on William Blake: Instead of an Afterword.” It is Malmquist’s intention to call attention to what appears to be a neglected (because in Danish) critical masterpiece: William Blake: Kunstner Digter Mystiker [Artist Poet Mystic], published in Copenhagen in 1933. Excerpts from Grønbech’s book are provided in Swedish with occasional editorial comments. It is clear that Grønbech’s accomplishment was an extraordinary one. The excerpts display an understanding of Blake’s thought and of his modes of utterance uncommon, to say the least, in 1933. His insistence that the illuminated books can be appreciated only as composite works must have seemed even more unusual. And sometimes Grønbech’s words seem to leap out of his time to address the cultural and critical confusion of our own: ↤ 5 Pages 56-57; our translation into English from Malmquist’s translation into Swedish. Space does not allow further quotations here, but an English or American publisher could render a service to scholarship by bringing out a translation of William Blake: Artist Poet Mystic. Meanwhile, Malmquist deserves credit for drawing attention to Grønbech’s book, Isaksson for making The Marriage accessible to Swedish readers, and Epokhe Publishers for this daring if only partially successful enterprise.